This MaxTow Custom Gauge Package allows you to select 3 truck gauges from MaxTow’s Blue Double Vision™ Gauge Series to install with the included truck specific triple gauge pod. The MaxTow Double Vision Gauge Series offers users with a dual readout display that includes a “quick glance” blue LED digital display as well as the classic look of an analog gauge through use of the illuminated red needle. Each gauge features a diameter of 2-1/16" (52mm) and out performs the competition by utilizing the combination of electronic sensors and stepper motor technology that allows for extremely smooth needle movement and precise gauge readings. MaxTow Gauges also feature daytime (d1, d2, d3) and nighttime (n1, n2, n3) dimming modes where you can set your preferred brightness level whether you’re driving during the day or the late hours of the night! The included brightness recall function remembers the previous brightness setting you had selected before powering your truck down so you won’t have to worry about resetting it every time you power your truck on! MaxTow includes extended wire harnesses for both power (3') and sending unit (9') connections to ensure you’ll have more than enough for a complete installation! The included Triple Gauge Dashboard for 1999-2007 Ford Super Duty allows you to horizontally mount (3) 2-1/16” (52mm) gauges to the dashboard of your Power Stroke diesel or gas truck. 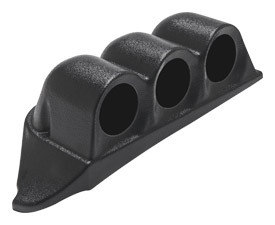 This gauge pod is crafted from high quality ABS plastic and features a custom molded mounting plate that sits flush and level on the left side of the dashboard, right above the cluster. Featuring a width of 12”, height of 4-1/2” and depth of 5-1/4”, this dashboard pod allows you to conveniently monitor 3 of your truck’s most vital engine functions, while also being able to retain the factory grab handle of 2003-2007 F-250 and F-350 trucks. Mounting this pod to the truck’s dashboard is a breeze with the included mounting screws and step-by-step installation instructions included with each pod. This pod is only offered in the color black, but users have the ability to paint the pod to their preferred color using ABS plastic paint. MaxTow includes free lifetime technical support and a one year limited warranty with each purchase. Note: This dashboard gauge pod cannot be used with a GlowShift quad pillar gauge pod installed as the bottom gauge cup will hinder the installation of the dashboard pod.